MuLab Free is fully functional but is more limited than MuLab XT and MuLab UL. Soft Noise is applied when going beyond the limits of MuLab Free. MuLab Free is fully functional but is more limited than MuLab XT and MuLab UL. MuLab is a top-quality sound and music production system for Mac OSX and Windows, transforming your computer into an inspiring modular studio. 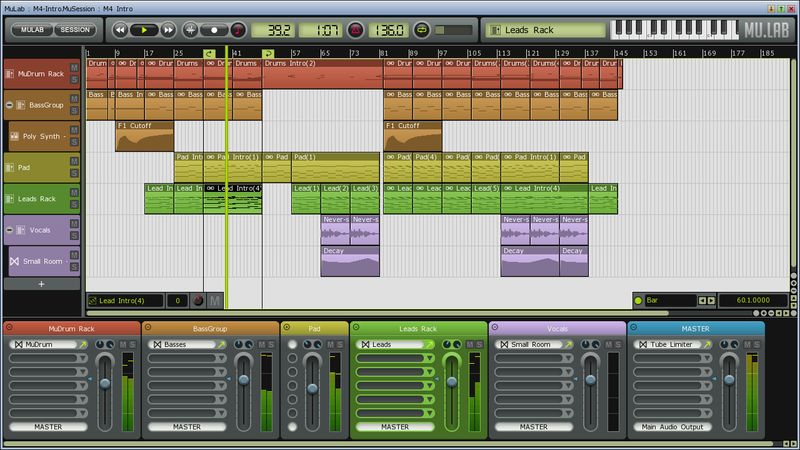 MuLab is an easy, effective and rock-solid tool designed to create, record, and finalize Your Music! Optimized the "Auto Bypass" function. Now you can use MUX VST to spare CPU cycles in hosts that constantly do plug-in processing even when the plugin is only processing silence. New "Export" function for MultiForm Oscillator wavetables. Bugfix for MUX 64 bit VST host engine which could cause crashes, especially when using more than 4 GB RAM in the host address space. Bugfix for Create Multisample/Sequence Using Markers: In case of many markers the key could go beyond max key 127. Fixed. Bugfix for odd track/part colors. Bugfix for bug when mixing down to an audio file that is already used by the project. Bugfix for bug in LFO editor when inputting eg "3/8". Before popping up a 'Locate file' dialog, MuLab/MUX will first look for it in the source file folder and its "Audio" sub-folder. Bugfix for an issue with the play position line. Bugfix for crash bug when doing "Edit MIDI Input Channel Targets" with MuLab 64 bit. Improved Step Recorder and Sequence Editor interaction. Bugfix for mono legato filters to properly apply key tracking. Bugfix for Multi-point Envelope velocity sensitivity. Default Audio Setup now uses MME Sound Mapper. "MME Audio" renamed to "MME Audio Output". Added a workaround for a possible crash problem in Steinberg hosts eg Cubase. Added a workaround for a resize problem in Steinberg hosts eg Cubase. Bugfix for a possible UI lag problem when using multiple MUX VST plug-ins. Preference "WindowsProcessPriority" which allows to set a higher process priority on Windows, resulting in a more solid audio engine. Control+click in the middle of a part/note/zone now also deletes it. New monophonic mode for great solo sounds. Improved VST engine especially wrt VSTs that rely on timing info from the host. Rack naming: If loaded from a preset, the preset name has more priority than the first plug-in name. Added a bypass for a load problem in ToonTrack EZ Drummer. Fixed a bug in the VST engine which could cause improper syncing between host and plug-in. (eg Kirnu Cream). Fixed a bug with the wrt the session editor window size when loading sessions that were saved with another editor window size. Fixed a bug that could cause audio noises. Fixed a bug that could have various consequences during initialization. Improved log info for better diagnosing certain problems. BugFix for a rare crash bug when inserting a new module in a rack or MUX deep editor. BugFix for a bug wrt MIDI event processing for system MIDI messages like Active Sense etc. BugFix for an issue wrt music time calculations, for example visual in looped sequence parts that were not drawn as looped. Bugfix for a problem with drag-dropping external files into MuLab / MUX. Bugfix for issue VST editors when doing "Close All Module Editors"
Bugfix for problem when replacing a VST plugin by another VST plugin while having opened a generic VST editor for that plugin. Improved stability of the VST plug-in interface. When clicking the MuLab window button on the taskbar, the MuLab window now properly minimizes/restores. Windows now properly do maximize/restore. Smoother parameter slides via UI or automation. Improved MuLab Free/XT product limits. Bugfix for parameter modulation system. Bugfix for crash when editing a sequence part with no sequence. Support both 32 bit and 64 bit versions. Bugfix for a load bug for certain MUX preset files. In some cases an empty tool tip was shown. MUX Play Editor: Module buttons can get a fixed color, fixed to the PE layout, independent from the module color itself. New Parameter Event Generator and MIDI Controller Generator modules. Dropping a sample on a multi-sample player (e.g. MultiSampla or the "Sampler" in MuSynth) adds a new full range zone for that sample. "Basic Effect" preset now includes a simple gain parameter in its Play Editor. In certain situations, Import Audio File, Import Sample Loop and Import Sampe Sound could use an inappropriate rack. Musical resolution improved from 1200 to 12000 PPQN. Better timing when recording MIDI events and parameter automations, especially when using a larger audio driver buffer size. Finetuned 2 practical things in the Pure demo session: Track headers were too wide and it had no metronome sound. Posted by dave on Thu, 10/10/2013 - 20:04. Posted by MAE11 on Thu, 05/12/2011 - 04:58.